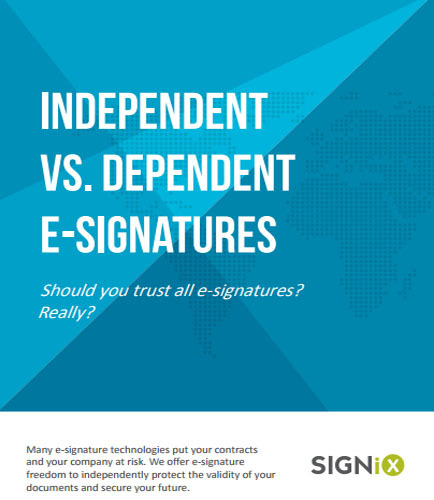 Why only Independent E-signatures? Why not dependent E-signatures? "Why only Independent E-signatures? Why not dependent E-signatures?" E-signature evidence is vital for transactions, especially important for highly regulated industries, including financial services, healthcare and government that place a heavy emphasis on security, compliance and data privacy. E-signatures are proven to save money, generate efficiency, improve document accuracy and enhance security. Are you using a vendor free e-signature? Does it offer independent evidence? Independent E-Signatures gives complete ownership and control over your signatures and documents. E-signatures let you store documents on servers, without relying on third party to maintain unnecessary copies. Whereas dependent e-signatures links back to the e-signature vendor for verification. What if the links in your e-signature are broken or not linking? You could end up losing data. How to pick the right e-signature solution for your organization? What are the consequences faced in dependent E-signatures? What are the benefits of Independent E-signature? Are you getting the independent evidence you need for your e-signatures? Download this white paper to understand the problems faced when you choose an improper e-signature solution and why choosing a right electronic signature is important for highly regulated industries in maintaining costs, improve document accuracy and enhance security. IoT is here, fueling the fire for cyber risk via mobile sources. By 2020, there will be more than 1,000,000,000 M2M (yes, a billion plus!) connections, each device module capable of accessing your network by a malicious hacker. Are you or will you be prepared? Despite growing security risks, budget constraints and a perceived lack of internal concern have led to a slow adoption of formal mobile security policies and technology solutions. Most enterprises are inexperienced in mobile applications security and the developers don’t completely focus on the security but their functions, thus making them vulnerable to security threats. Technology is evolving rapidly and keeping that in mind, the executives must have clear-cut answers to all the possible mobility use-scenarios with a robust security solution in place to ensure business information is kept secure and is only accessible to those who need to access it. Download this informative whitepaper to get an insight on the things that will spur this industry on to better tools and best practices that will accelerate the Enterprise Mobility Security Adoption and how IT organizations can use them for better productivity without compromising protection.